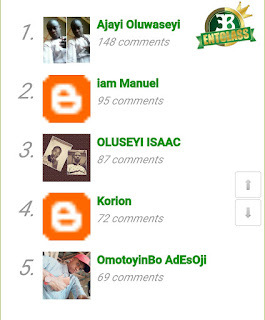 Back to the giveaway; i will be giving out free Airtime to only these five active users on Entclass Blog for the month of November 2017. Ajayi Oluwaseyi has taken the first position from OLUSEYI ISAAC who was in last month's first position. Lest i forget, a new commenter "Daret" joined us this month with an Anonymous profile. I've always made it clear that we all should use Google account when commenting, so that i could gather all points. If your name was listed above, kindly drop your phone number and the network in the comment box below. After that, you will be credited automatically upon confirmation. Your airtime has been sent. @victor kachi I didn't know that before but I was jst so captured by the wonderful articles I do see here and since last month av been a loyal family. So baba don't let me out oooooo ur boy dey here 👆👆👆. Issue of google account now noted. You should have used a Google account to make this comment if it's really solved. Your airtime has been sent because you have just convinced me. Why are you guys love claiming what doesn't belong to you. You want to claim what doesn't belong to you. You went ahead to create a Fake profile thinking i wouldn't know? Try harder. I'm just being smart. Try harder next time. You are a big thief. You want to claim what doesn't belong to you. You went ahead to create a Fake profile thinking i wouldn't know? I'm not a kid. Smart move there Kachi, the mumu guy hustle don cast, chaii. ������ nice one. I have a simple way of checking out real accounts before sending the Airtime. Cool bro, I've seen it. @iam Manuel, sorry i didn't approve your comment because you used a word that is too big and not safe for this blog. I have sent you your airtime from the number in your comment. Thanks for your understanding.